SQL Server command-line utilities give database administrators a new way to access the database engine and its components. Learn about each utility and its command syntax, starting with the sqlcmd utility. SQL Server command-line utilities give database administrators a new way to access the database engine and its components. In this three-part series from the book “Microsoft SQL Server 2008 R2 Unleashed,” we'll review each utility and its command syntax. The first is the sqlcmd utility, which connects to SQL Server from the command prompt and executes T-SQL commands. This chapter explores various command-line utilities that ship with SQL Server. These utilities give administrators a different way to access the database engine and its related components. In some cases, they provide functionality that is also available with SQL Server’s graphical user interface (GUI). Other command-line utilities provide functionality that is available only from the command prompt. For each utility, this chapter provides the command syntax along with the most commonly used options. For the full syntax and options available for the utility, see SQL Server Books Online.Table 5.1 lists the command-line utilities discussed in this chapter. This table lists the physical location of each utility’s executable. The location is needed to execute the utility in most cases, unless the associated path has been added to the Path environmental variable. After you save the commands in a file with a .BAT extension, you can simply double-click the file to execute it. This approach is much easier than retyping the commands many times during the testing process. 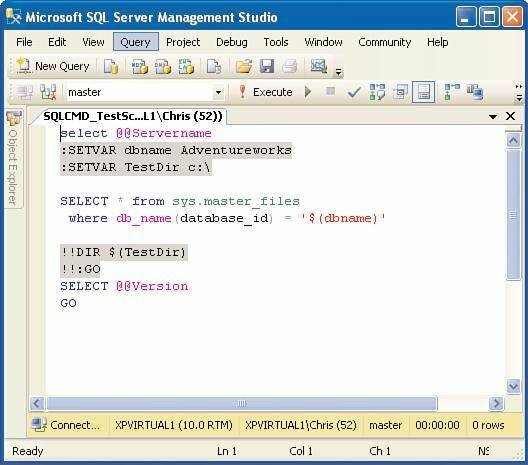 The SQL Server command-line utilities available in SQL Server 2008 are basically the same as those offered with SQL Server 2005. This has some key benefits for those who are familiar with the 2005 utilities. Very little has changed in the syntax, and batch files or scripts you have used with these utilities in the past should continue to work unchanged. Utilities removed from SQL Server 2008 include sac. The sac utility can be used in SQL Server 2005 to import or export settings available in the graphical Surface Area Configuration (SAC) tool. Both the sac command-line utility and SAC graphical tool have been removed. Similar functionality is now available via policy-based management and the Configuration Manager tool. The sqlcmd command-line utility is the next generation of the isql and osql utilities that you may have used in prior versions of SQL Server. It provides the same type of functionality as isql and osql, including the capability to connect to SQL Server from the command prompt and execute T-SQL commands. The T-SQL commands can be stored in a script file, entered interactively, or specified as command-line arguments to sqlcmd. The number of options available for sqlcmd is extensive, but many of the options are not necessary for basic operations. To demonstrate the usefulness of this tool, we look at several different examples of the sqlcmd utility, from fairly simple (using few options) to more extensive. Before we get into the examples, it is important to remember that sqlcmd can be run in several different ways. It can be run interactively from the command prompt, from a batch file, or from a Query Editor window in SSMS. When run interactively, the sqlcmd program name is entered at the command prompt with the required options to connect to the database server. When the connection is established, a numbered row is made available to enter the T-SQL commands. Multiple rows of T-SQL can be entered in a batch; they are executed only after the GO command has been entered. Figure 5.1 shows an example with two simple SELECT statements that were executed interactively with sqlcmd. The connection in this example was established by typing sqlcmd at the command prompt to establish a trusted connection to the default instance of SQL Server running on the machine on which the command prompt window is opened. Figure 5.1 Executing sqlcmd interactively. The capability to edit and execute sqlcmd scripts was added to SSMS with SQL Server 2005. A sqlcmd script can be opened or created in a Query Editor window within SSMS. To edit these scripts, you must place the editor in SQLCMD Mode. You do so by selecting Query, SQLCMD Mode or by clicking the related toolbar button. When the editor is put in SQLCMD Mode, it provides color coding and the capability to parse and execute the commands within the script. Figure 5.2 shows a sample sqlcmd script opened in SSMS in a Query Editor window set to SQLCMD Mode. The shaded lines are sqlcmd commands. Figure 5.2 Executing and editing sqlcmd scripts in SSMS. Using a trusted connection is not the only way to use sqlcmd to connect to a SQL Server instance. 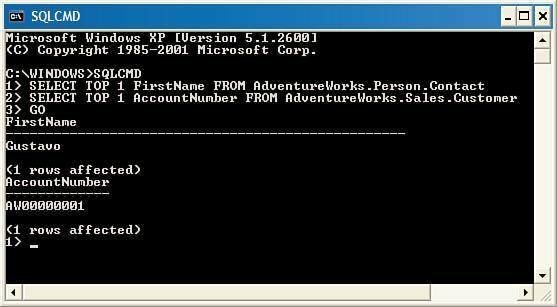 You can use the –U and –P command-line options to specify the SQL Server user and password. sqlcmd also provides an option to specify the password in an environmental variable named sqlcmdPASSWORD, which can be assigned prior to the sqlcmd execution and eliminates the need to hard-code the password in a batch file. The execution of the preceding example backs up three of the system databases and writes the results to the output file specified. Scripts that utilize variables, sqlcmd commands, and the many available options can be very sophisticated and can make your administrative life easier. The examples in this section illustrate some of the basic features of sqlcmd, including some of the features that go beyond what is available with osql. Sqlcmd: 'KReadOnly': Unknown Option. Enter '-?' for help. There is no -K option, it seems not available! What could be wrong here? !